As I was brainstorming ways to help my child learn about the joys of giving this holiday season, I began to realize there easy opportunities for incorporating fun and sharing into our existing holiday traditions. 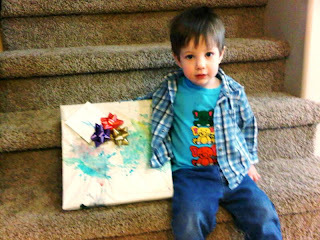 One of the things Little J and I are excited about is making all of our holiday gift-wrap this year. He loves to paint, draw, trace, cut, paste and stick stickers. Now that he knows that his masterpieces will be used to make a special gift for family and friends, he is even more keen to create! Visit the "roll end bin" at The StarPhoenix (204 5th Avenue N) and pick up a roll of blank newspaper for only a loonie! Visit the Dollar Store for a cheap bag of bows and/or ribbon and either tape or glue sticks. Everything else you'll need, your little ones probably already have: crayons, markers, watercolours, fingerpaints, construction paper, scissors, stickers . . . and creativity!